The chill. It snakes up my legs and into my skin and pinks my cheeks in ways my southern blood is not accustomed to. The moment I step outside, I feel paler, smaller, ephemeral in time. It’s a blistery kind of chill, one my coat is also not made for, billowing around my knees the way it does. Yet here we stand, on the humble Hawes pier, gazing up at the crimson skeleton of Forth Rail Bridge in the seaside town of Queensferry, a royal burgh of West Lothian. Since arriving for the summer at the University of Edinburgh, I’ve felt a deep longing to commit myself to any and all exploratory whims and adventures. My classmate Isabel and I have taken the day to wander further than we’ve yet gone under Dr. Burgess’ encouragement to travel as often as possible. Because our studies revolve around Gaelic mythology and culture, I can’t help but desire to bring back to her stories of our sightseeing. Today, we’ve chosen to explore the Iona of the East. From the promotional photo I spotted at the peak of the Royal Mile, just outside the entryway of Edinburgh Castle, Inchcolm Abbey Island seemed the ideal escape from the bustling city streets. I had since dreamt for many nights about the prospect of boarding a ferry to reach the desolate isle in the Firth of Forth. From the Scots’ Gaelic "Innis Choluim," our destination’s name means “Columba's Island,” for the Irish abbot and missioning evangelist famed for popularizing Christianity in the lands that would become known as Scotland. He supposedly visited the island in 567 AD, and it was named for him in the 12th century. Ruins of an Augustine Abbey along the isle’s shores make it a prime tourist stop for curious minds. It’s my second week in Scotland. It feels as if I’ve lived a lifetime since the moment I first arrived on its lush foreign soil. The days flit by in passing color and sound. Isabel has become my fellow traveler—irreplaceable, effusing comfort. We step onto the Maid of the Forth ferryboat with a string of sleep-eyed families as if leaping off the edge of the world. The sea, a vast expanse of refracted sunlight, sways under the weight of us but recedes steadily into the horizon. I wrap and rewrap my knit Heritage Collection scarf, a luxurious purchase from the shops near Grassmarket Square, around the circumference of my neck until I trick my throat into believing it doesn’t hurt to breathe. The wind has gotten to me now, not far behind the chill, seemingly whistling through my blood. I shiver. Several medieval bishops of the diocese of Dunkeld were purportedly buried within the Abbey church; a skeleton was found standing upright, built into one of the abbey’s walls, in the 1880s, although its time of death is unknown. “I hope the sun comes out soon,” I whisper. Isabel nods, her pale skin glimmering despite the overcast. She flinches at the wail of a nearby infant and collects her purse beside her. “Let’s move to the helm," she replies. I nod, following her lead to the other side of the boat, enclosed in walls and floors of wooden planks with gleaming windows aligned on each side. We find an empty bench near the front that suggests the most warmth and burrow into it. I glance down at her flip-flops and smile. Nothing seems to phase her. I doubt the island’s darker secrets would have either, although neither of us knew of them at the time. In its heyday the island was used as a home for hermits. Evidence suggests this was the case in the 12th century, at which time King Alexander I found himself marooned on the island. He is said to have been cared for by one of the hermits in the year 1123. After that, Alexander made the island the home of an Augustinian monastery. The property includes a large square tower, a predominantly ruined church, refectory, cloisters and a chapter house. Some leftover fragments of stonework with carvings, dating to the Dark Ages, imply Christianity had a very early founding on the small isle. The Scottish monastic ruins are known as the best preserved from medieval times. “Chips and biscuits! Get your chips and biscuits!” bellows a young ferryman midship. Red-cheeked children leap up from their seats, mittens cupped in supplication for a pound or two. I close my eyes and await sunlight. Isabel sleeps fitfully by my side as the boat rocks from side to side, clenching her white fingers ever so often as if to take hold of a fleeting dream. I envy the peace tucked into her expressions—such a peace I’ve yet to find in all the journeys we’ve made. I lay my chin atop the guardrail, waiting for the past and all recognition of it to drip steadily from my conscience: college, high school, childhood, home. We doze off for several moments when I awaken, blinking with recognition of new territory. The abbey rises starkly against a pale lemon sky, the sun-beaten stone a colossal stronghold in the midst of enduring history. The toll of long-worn bells pulse through our thoughts as if its inhabitants still remain. The island’s endurance is a sign of strength. 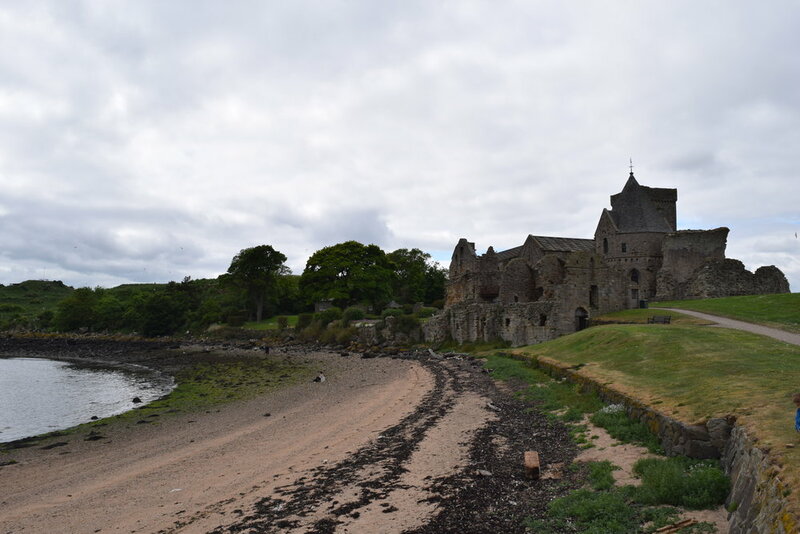 During the Scottish Wars of Independence in the 14th century, Inchcolm was attacked numerous times by British raiders. Then in the First and Second World War, it served as a part of the Firth of Forth’s defenses. Wartime engineers even built a tunnel at the island’s east end for defense purposes, effectively making their mark forever. We dock at the small isle's pier, replete with cascading limestone cliffs and sprawling grassy fields. The abbey looms overhead in ruin, staking claim over the pebbled beaches below. It seems to claw up from the soil, stone jolting through sediment, through the barriers of time. We step off the ferry in clumsy awe and shared silence. It seems to me to be the smallest island I've ever set foot on; with every turn of my chin, there is ocean, there is rocky plateau, there is the possibility of falling off the edge of reality. But none of this seems real, and I feel as if I'm intruding on sacred ground, on someone else's idea of isolation. It isn't ours to find. But we move forward. The rotunda of the abbey chapel casts its shadow over the rest of the gaping ruins with a wrought iron steeple and glass paneled windows in varying shapes. The place itself is a maze; there are roofless tunnels leading to darkened corridors and a wide, open prayer garden with a startling expanse of green field. There are innumerable gothic windows, barren of glass or iron bars, cut out of the stone walls that allow sunlight to streak through the dust. They are not two feet off the ground, and Isabel and I climb into them to revel in the quiet of what once was. A winding stairwell of uncomfortably narrow width leads up to the highest level of the abbey, but it takes Isabel and I a fearful moment to inch our bodies up the miniscule steps, fit for the soles of infinitely smaller feet. Upon reaching the top, however, we are able to gaze out over the rest of the forested isle and the lone sailboats ported along Mortimer’s Deep. We climb our way back down in mutual joy before stumbling onto the rocky beach below. Isabel tosses her sandals into the brush and skips into the water's gray edge. I watch her frolic and smile, if not for the present, then for the many days of my past that led me to this island. I shield my eyes from the sun and tug my coat around me closer as the air picks up a gentle breeze. The dock teeters atop the sea in a snake of caramel wooden planks. I am alone but for a few straggling tourists on the shore, so I wander farther out onto the swaying path, curl my legs beneath me, and lie down. Face to the blinding sky, I think of home once more. I think of my father and how much he would admire the serenity of a place like this. I think of all the searching I've done in the past twenty years, only to find myself immovably lost on a desolate shore. The spray of the ocean against the rocky hills lulls me to a strangely enveloping sleep. When Isabel finds me to announce the return of our ferry boat, I smile, lost—but for a moment, in the midst of reminiscent dreams.